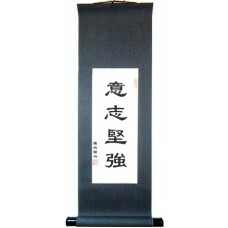 Choose from our extensive selection of Chinese virtues or morals for a hand made calligraphy wall scroll. Many of the characters for the virtues below are commonly used in Chinese culture. You will also find in our list below many of the same virtues as in the Bible including the famous fruits of the Spirit. These Chinese virtue wall scrolls are excellent reminders to live our lives in the right way and treat others the way we want to be treated. In Chinese culture it is common to give others good wishes and you will find many good wish scrolls below. Chinese symbols have a deep meaning and we have chosen the best symbols that are commonly used in China and also represent virtues that are meaningful to a Judeo-Christian Western background. All items are 100% handmade and customizable. Choose flower, bamboo, or butterfly and bamboo backgrounds for any scroll! The Chinese characters for "courage" or "courageous" mean the same in English. These are the ch.. The Chinese symbols for courtesy are simple and tell us the virtue of being courteous to others.. This is the Chinese virtue of creativity and makes and excellent gift for artists, writers, or .. The Chinese virtue of determination means exercising your will power to finish a task or achiev.. This four character Chinese calligraphy symbols scroll features the Chinese characters for "det.. This dilligent in Chinese wall art features the virtue for dilligent, which is one of the most .. This traditional Chinese art scroll features the virtue "do right." That means when you see a c.. This traditional Chinese virtue denotes "enthusiasm" or "enthusiastic." The point is to face li.. The virtue excellence means doing your absolute best in a given task, like the phrase in the Bi.. The virtue "faith" means to have trust or belief in something or someone. 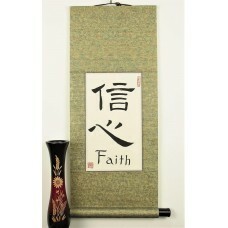 It is often used for ..
Get Asian calligraphy art with the term "faithfulness." These are the same Chinese characters u.. 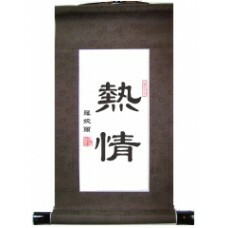 This Chinese calligraphy wall art features the virtue "filial piety." In everyday vernaculary t.. This Asian brush painting portrays the Chinese virtue of "flexibility." This means what it soun.. These characters mean "foresight." They portray the quality of thinking ahead. Script: Poem will ..